That may beat SunBlock, Lagniappe, and every other LLC name combined. Joe Jaeger...of the Jaeger Foundation. Winvestco, a firm owned by former Nagin adviser and business partner David White, each also gave Georges $1,000. "You remember our old buddy the Jaeger Foundation that was lucky enough to get all those properties in Algiers donated to them"
Sometimes, in the course of history, you have to claim some lebensraum. Seriously, who names their llc "aryan... something", and what nimrod at Georges' campaign takes the check thinking "Yeah this looks fine and could never come back to haunt us"? man...I need to consult with you before I label posts. I had to look that one up...damn that's good. As for it coming back to haunt him, it won't because he has successfully bought every media outlet in the city. I just found that out the hard way. I think TP will now stand for Timid Pussies or maybe Thoroughly Paid. The previous post on the Deke's has pulled down over 13k views and not a peep from any MSM outlet in the city. Given alll this horrible stuff surfacing about Georges, I think Energizer should ZEALOUSLY defend their trademark Energizer Bunny against the way John Georges used it in his mailer against Mitch. See www.dailykos.com for that one. Energizer won't do anything. Small potatoes for them. What makes you think they even know about his mailer??? I know for a FACT that they know about the mailer -- called them myself the day it came out. You win the prize, Dambala. See the Jeff Parish scandals and what does not get reported by the TP, now or in the past. And who know what else they smother. timid pussies....LOL... they don't wanna start looking at those fraternities. who knows who would get implicated. probally more than a few people with close ties to the timid pussies themselves. 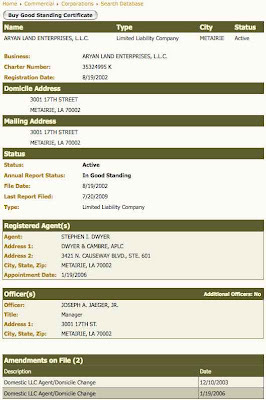 Who wants to bet Jaeger "advised" Jindal to use his construction firm? FYI -- Aryan is the "A" in Joseph A. Jaeger. In this case you are finding bogeyman where none exists. noticed that the jager companies in the "cluster bucks" article and aryan land enterprises all share the same domicile of three thousand and one seventeenth street in metry. it might behoove a good researcher to find other entities at that location and identify their campaign contributions. i personally don't have the time for all that crap.